Floating floor has increasingly become the installation method of choice for many types of floor coverings. Due to its ease and simplicity, floating floor installation saves money and helps installation go a lot faster. Floating floor is not a type of flooring. Rather, it is a method of installing a floor. Individual planks, boards, and–in rare cases–tiles attach to each other, not to the subfloor. They may attach with glue or by snapping together. Laminate Flooring: The prime example of a floating floor is laminate flooring. Almost no laminate flooring is glued down to the substrate. Nearly all laminate is installed on a floating basis. This allows the flooring to respond to changes in a room's relative humidity by expanding and contracting. Luxury Vinyl Flooring (LVF): LVF snaps together, board-to-board. It can also be glued to the subfloor. Tiny tongues and grooves engineered into the boards allow them to lock together. Engineered Flooring: Most engineered wood flooring nails or staples down to a plywood substrate. However, a few brands–such as Armstrong's Lock & Fold–can be installed on a floating basis. Solid Hardwood: Solid hardwood is never installed as a floating floor. Instead, it is nailed into the subfloor. Ceramic Tile: Almost all tile is mortared to a substrate. However, a couple of floating tile floors are available, most notably Soapstone. Rather than mortaring down the tile to the floor, the tiles are attached to each other via interlocking plastic trays. High cost has been the obstacle to this product catching fire in the consumer market. Carpeting: Wall-to-wall carpeting, at first, may appear to be a floating floor. Yet the edges are secured to the subfloor via tack strips. In any case, the floating floor designation applies only to hard floor coverings (laminate, vinyl, etc. ), not soft coverings, like carpet. One way to understand the floating floor concept is to think of a jigsaw puzzle. With a jigsaw puzzle, pieces connect to each other, not to the table. What keeps the puzzle in place are the weight of the puzzle; friction contact between puzzle and table; and side-to-side attachment of the individual pieces. You can also think of a floating floor as a type of rug, but a rug that is made of hard materials. In theory, you should be able to move your floating floor around minutely in order to readjust it, much as you would do with a living room area rug. In practice, this is impossible for the reasons listed below. For ages, floor coverings were attached to their underlying substrates. Hardwood floors do need to be nailed down to the subfloor. Ceramic and porcelain tile also need to be mortared to their bases. As do-it-yourself floor installation gained in popularity, methods had to be developed to ease the complexity of installation for homeowners. Development of the floating floor freed novice floor installers from dealing with manual nailing or air compressed floor nailers. It benefited professional floor installers, too, allowing them to lay down floors at a faster rate. Sheer Weight: Even though individual laminate planks are lightweight, collectively they can weigh several hundred pounds across an entire room. This unified, large structure is difficult to move. Friction: Below laminate is foam or cork underlayment. Friction between flooring planks and underlayment controls, but does not completely eliminate, lateral movement. This lateral movement is desired so that the flooring can expand and contract with changes in humidity. Joinery: Laminate boards positively snap or glue together. This positive joinery means that boards cannot come detached very easily. Expansion/Contraction: Laminate flooring is contained on three or four sides by walls. An expansion gap is required around the perimeter of laminate flooring, which means that confinement is not one method of keeping the floating floor in place. One advantage of the floating floor method of installation is it allows for the floor to move and expand in response to changes in a room's humidity. Easier: Floating floors remove many obstacles to do-it-yourself installation. For instance, nailing down hardwood flooring can be a daunting task for DIYers. But with a floating laminate floor, the floorboards easily attached to each other with no specialized tools such as a floor nailer. Cheaper: Easier often translates to cheaper because you can eliminate paid labor and do it yourself. Thinner Materials: One of the disadvantages of a floating floor is that it is thinner and less substantial than flooring that attached to the subfloor. Lesser Quality Flooring: Traditionally, floors that install with the floating method have been floors that are less favored by homeowners, such as laminates and vinyl. 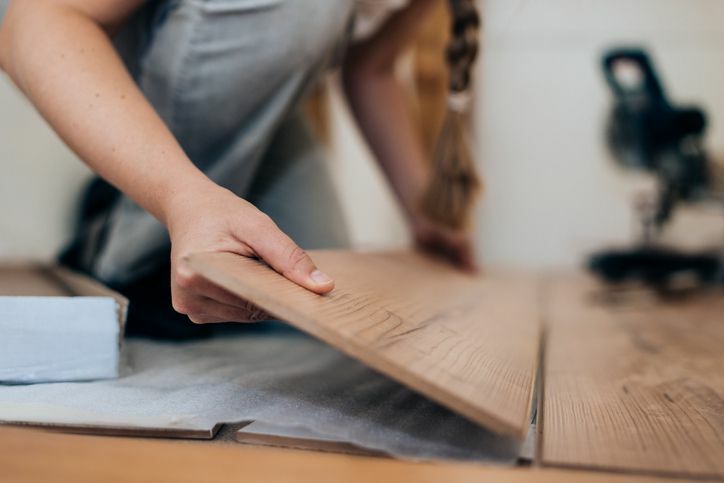 While these floors still tend to command lower resale value than solid hardwoods, the quality gap between the two is slowly closing over time. It is generally not advisable to install flooring over a floating floor. Floating floors tend to disassemble easily since they are not attached to the subfloor. Newer laminate floating floors are dry-joined with a fold-and-lock mechanism; they are simple to detach. Older laminate floors may be glued together, plank to plank. But because laminate is made of thin fiberboard, it is easy enough to snap off and break the flooring rather than dealing with the glue. If you do decide to install a floor covering over your floating floor, you will need to install a hard underlayment such as plywood or cement tile backer prior to laying the floor covering.